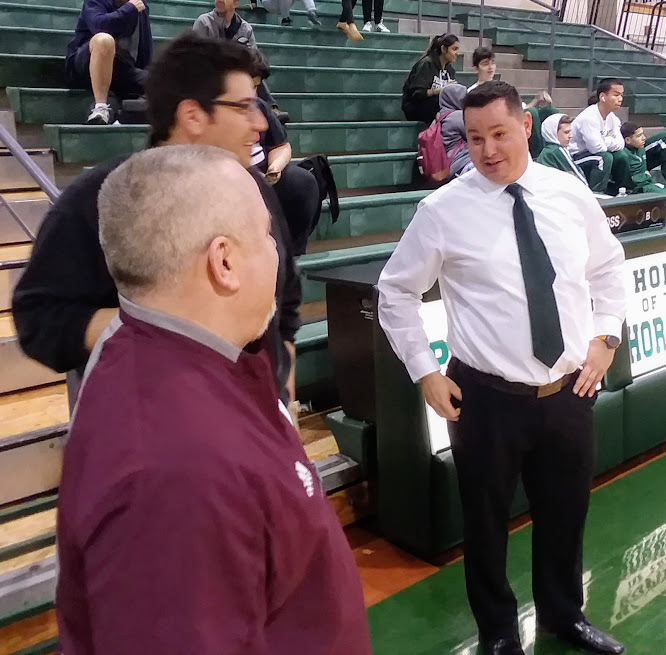 Holsworth enjoying his team’s progress while looking to what could be a tremendous future for the PV boys’ basketball program | Mike Lamberti, From Margate To Cleveland, And Back ! ← The 9th Gift of Life Wrestling Duals, this Jan. 12; the Rose Bowl Parade, 2020, and the Transplant Games coming to NJ highlight a busy time for the legendary Michael DiPiano, Sr.
It’s been a good start for the Passaic Valley High boys’ basketball team, which won the Vernon Viking Holiday Tournament and played an excellent game against undefeated Wayne Hills, on Jan. 3. Head coach Jim Holsworth’s squad was 3-3 heading into a game at Lakeland, on Jan. 8. On Jan. 10, the Hornets host Clifton at 4:15 p.m. and on Jan. 15, Fair Lawn comes to PV for a 4:15 p.m. contest. 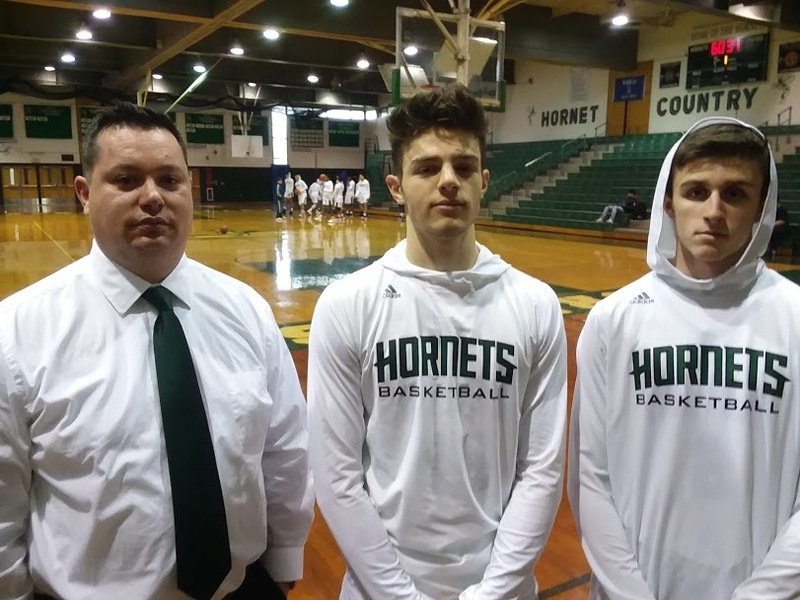 The Hornets had played a solid tournament in Vernon over the Christmas holiday. In the first round, PV defeated the host school, 80-50. before winning a close game against Mount Olive in the title game, on Dec. 28, 34-32. It was the first time the Hornets had won a holiday tournament in four years. Versus Vernon, Brian Whitney, a freshman, led all scorers with 23 points while older brother Elliot Whitney, a sophomore, had 14 points and Brandon Timothy finished with 13 points. Zander Timothy had seven points, Alex Actable, Steven Nitch and Angel Rodriguez scored five points each, Rashaun Rex and Antonio Bargiel scored three each and Justin Paruirigan finished with two. In the win over Mount Olive, Elliot Whitney led the way with 15 points while Nitch had 11. Whitney was named the tournament’s outstanding player and Nitch earned a spot on the All-Tournament team. With a 3-2 record, PV played its first home game on Jan. 3, opposite an undefeated Wayne Hills squad. Wayne Hills is now coached by Rob Carcich, the long-time PV head coach. Wayne Hills improved to 7-0 by defeating the Hornets, 61-47, but PV was very much in the game until the Patriots pulled away in the fourth quarter. Brandon Timothy led the Hornets with 15 points while Actable scored 13 and Elliot Whitney finished with 11. Belli led all scorers with 21 points while Pulast Thaker and Nebi Ademi scored 12 each and Jason Sanfilippo scored 10 for Wayne Hills.